It happens ever year. I can cook 354 days a year, but Thanksgiving comes along and I forget everything I ever learned about cooking. Lets start with the eggs. 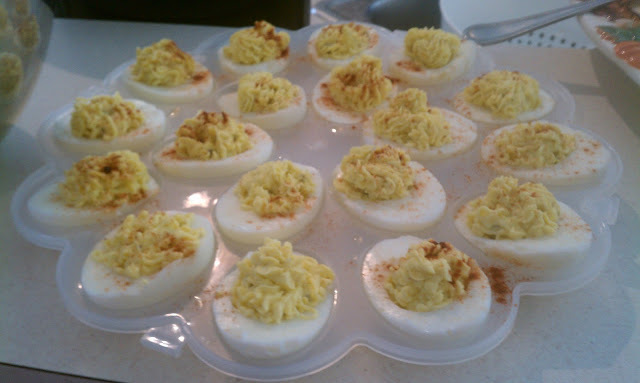 Boiled Eggs. You boil water, add eggs, boil, turn off! Peel! That is it!! I cooked them then ran them under cold water. As I was trying to peel the eggs, it keep pulling the whites off with it. I boil eggs for breakfast all the time and never have a problem. 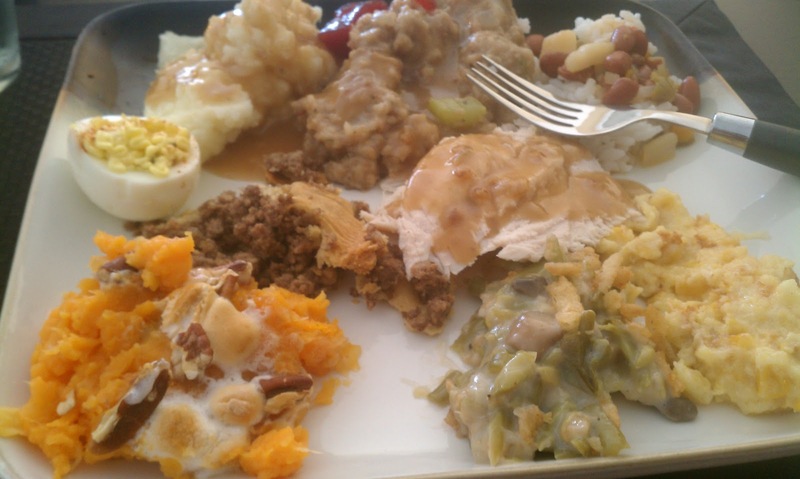 This is the third Thanksgiving in a row it has happened. 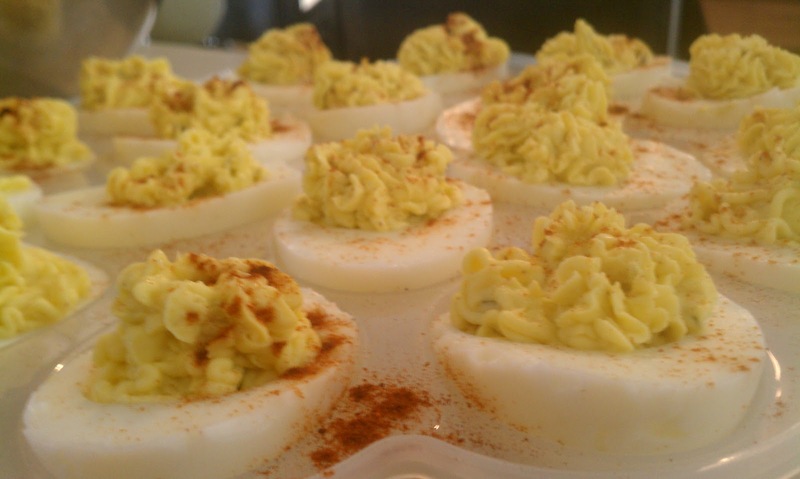 I make Deviled Eggs for Easter every year too. 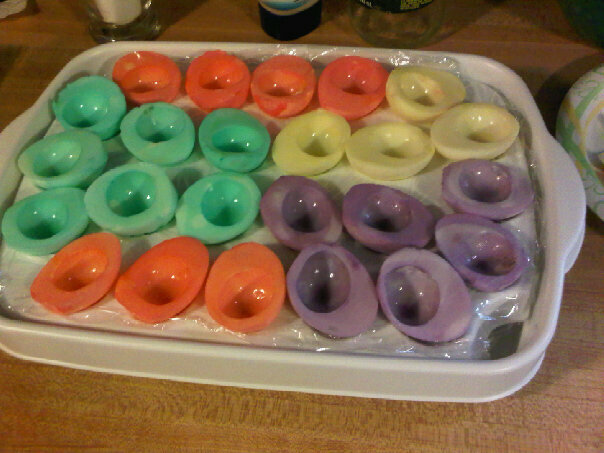 I soak the egg whites in a mixture of water and food coloring. It dyes the whites to the desired color. They always turn out great. It is just Thanksgiving!! I used a piping bag to make them look a little better. I was the only one who noticed how bad they looked. I did not have any Mayo either, so I used Kraft Food Horseradish Dijon Mayo. It actually turned out fine. Surprisingly. I also made Sweet Potato Casserole to take to Dan and Sam's from a recipe I found on Gina's Skinny Taste. I love her website. All her recipes are healthy or light. I have made a few of them and haven't found one I didn't like. 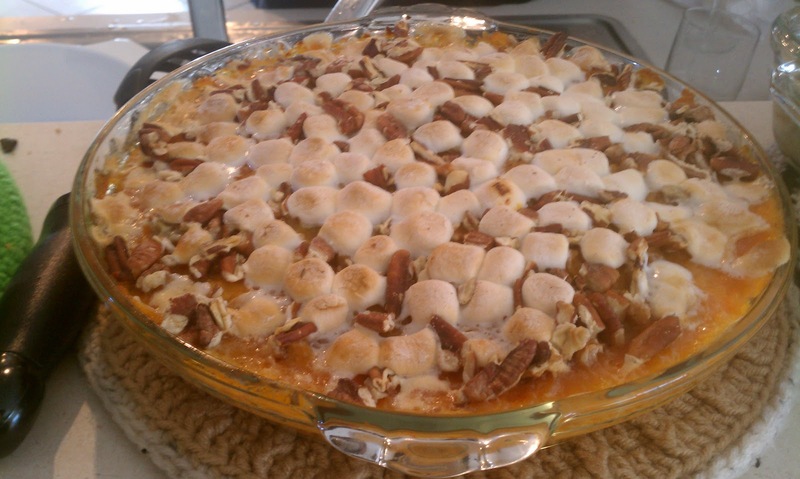 I'm not really a fan of Sweet Potatoes, but the picture looked so good. That is another reason I love her website. Her pictures are great. I did not measure the ingredients. With recipes like this, I usually don't. This is why I do not like baking!! I hate measuring. We met Dan and Sam three years ago on a cruise to the Bahamas. We were assigned to the same table as them and two other couples. We have stayed in contact through Facebook with everyone from the cruise. They live South of Orlando in Davenport and since we were not able to go home for Thanksgiving, they invited us to their house. On the way there, I got a little teary eyed after calling everyone and wishing them a Happy Thanksgiving. You never realize how important getting together with your family is until you can not be there. It was really nice being about to spend our first Thanksgiving here with them though. Yes, I ate all of this too!! We had Mashed Potatoes, Turkey, Gravy, Stuffing, Cranberry Sauce, Green Bean Casserole, Sweet Potato Casserole, Deviled Eggs, Puerto Rican Beans and Rice, and Dan's Pork Pie (Canadian Dish). 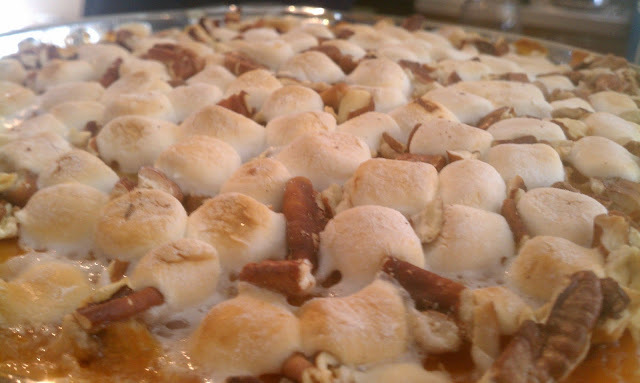 Oh and a piece of Pecan Pie. And we brought three containers of leftovers home! !